You don't wear fur, even if you could afford one and you would never buy an alligator-skin handbag. I'm starting to think that maybe feathers are the ideal alternative for glamour girls with a conscience? It's tempting to believe so. Designers have staged something of a revival in feather- wearing this year, why look at the feather braclet by Marc Jacobs for Louis Vitton. I was so inspired by the braclet that I created yet another board. "The feathers are flying" and they're landing on the table. Add some feather luster to your table with these tableware items. 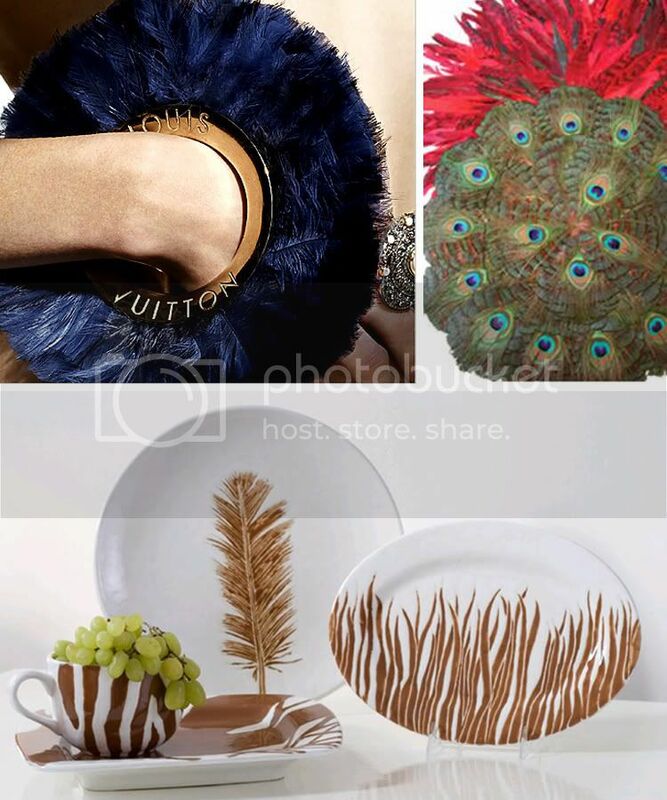 (above: Louis Vuitton feather bracelet, $2,310 at Louis Vuitton, Feather placemats, Chateau X by Jane Krolik; Place setting by Jessica Howard ceramics). Feathers make wonderful accents for fall arrangements. They are perfect accompaniments for foliage, flowers, fruits, vegetables, cones, and any dried material. Feathers are available at many flower shops and craft stores in all shapes, sizes, and colors. Many are dyed to enhance the hues and to give a wider selection of colors for varied decorating backgrounds. They may be added to a simple pot of ivy, or they can become the focal point in mantel urns. Add some to your fall table decorations or fill an interesting container with a group on a side table. (above: Large Peacock eye platter, $45.00, Bongenre). 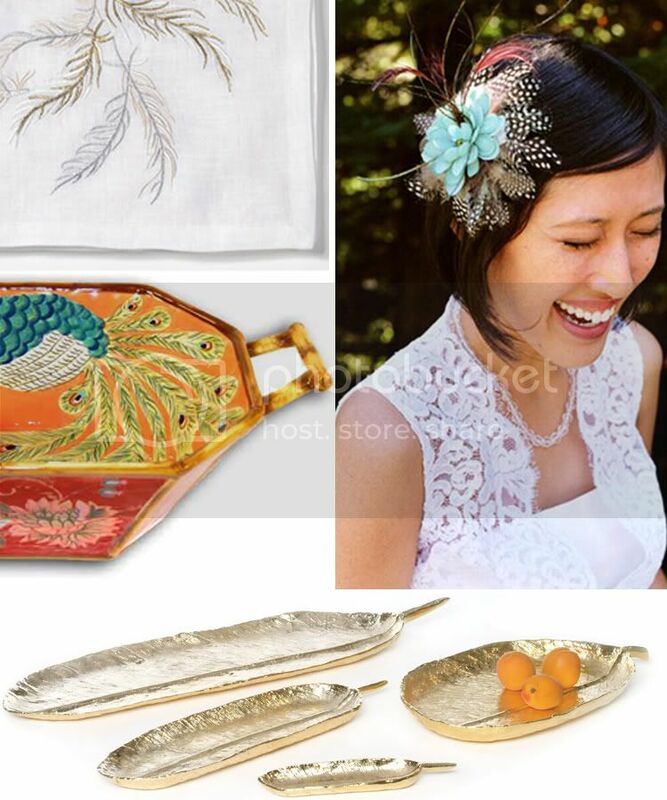 (above: feather napkin,$120.00, Vivre; Artensian salad bowl,$55.00, Tracy Porter; Feather hair clip, K. Autumn; Gold Athena Tray, $79.99, Lunares Home; invitations, boutonnières , bouquets, all images from Michelle Rago). Even a novice can add a few feathers and achieve a little pizzazz. Working with beautiful bird feathers is certainly an easy way to add a special look with truly a minor amount of effort and time. So go ahead, strut your stuff like a peacock! For even more "Feather Luster" fly right over to Perfect Bound, prepare yourself for take-off, her post will blow you away! OMG. I JUST posted about fall feathers. Are we on the same page or what?? I am linking to this post right now. You are genius. LOVE it! How elegant! I love all the peacock feathers. I've seen those Jessica Howard plates before. They are so gorgeous! Check out Decorative Instincts on Etsy. I blogged about her before and she has the most gorgeous feathered placemats & napkin rings. Absolutely gorgeous! Anne, OMG! It's true what they say; "Great minds think alike"!!! I started to see feathers all over the place...first on the Fall Runway last year, then in my girlfriends wedding they threw feathers instead of rice, then in the media (Domino, NYTimes, NY Magazine); but when I saw Michelle Rago's use of feathers I was blown AWAY. I thought to myself feathers ARE pretty darn fabulous I should do a post about them! Thanks for the link in, I'll be linkin' right back at ya. Come Clean, thanks for stopping by...Yes, the Jessica Howard plates are popping up all over blogs (aren't they great)! Kudos to Ms. Howard. 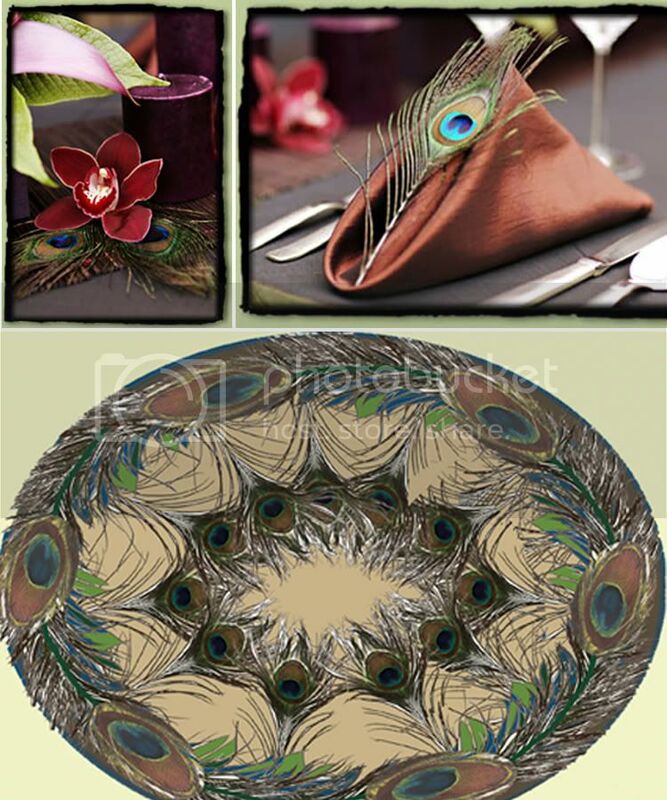 Ooooooooh Lara, the feathered placemats and napkin rings by "Decorative Instincts" are unbelievable! They are gorgeous. Event Planners and Stylist will surely be tapping into that source, since feathers are so hot right now. Those boutonnières are completely fabulous! I LOVE the image of the single feather against the brown napkin.. so sophisticated. ha! you're right - i love it! feathers for fall are everywhere in decor, peacocks especially! 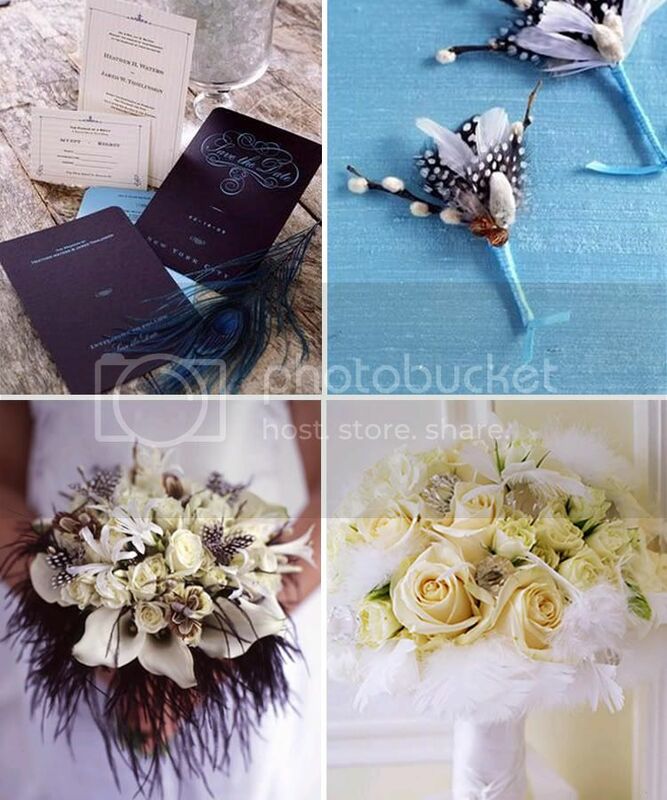 the bouquet on the left is gorgeous... the feathers add great texture. one of my dear friends is obsessed with peacock feathers, I just sent her this link. :) She had them incorporated in her wedding, it was so pretty. I know she'll love this post, as do I- before her wedding I never even really thought of using them with flowers, they sure add a great touch. I want to purchase come of the items I see posted here for my wedding--- how would I go about doing so? Just saw some very nice feather placemats at a South Florida Walmart in the Thanksgiving decor area. A trendy item at an affordable price. Just thought others would appreciate knowing this because I have seen some of these feather placemats for $70 a mat.